The Ice Cream Cone made its debut at the 1904 St. Louis World's Fair. While history gives us many stories on who actually invented them, Paul Dickson in his "The Great American Ice Cream Book" tells us that the International Association of Ice Cream Manufacturers (IAICM) has given Ernest A. Hamwi the credit for inventing the ice cream cone. Now while Ernest Hamwi was one of the vendors at the World's Fair, he wasn't actually selling ice cream, he was selling a type of waffle (zalabia). The story goes that one day, the man (Arnold Fornachou) at the next booth ran out of small dishes to serve his ice cream. Hamwi got the idea to roll one of his hot Belgian waffles into a cornucopia and told Fornachou to put a scoop of his ice cream into the cornucopia's mouth. They were an instant hit with Fornachou's customers and they lined up to have their ice cream served this new way. From there, because the cones were so popular at the Fair, the St. Louis foundries started manufacturing molds for making the cornucopia shaped cones. The cones were first given the name "World's Fair Cornucopia" until around 1909 when they were renamed "ice cream cones". The cone gained popularity across the United States and by 1924 Americans were consuming upwards of 245 million cones per year. This Ice Cream Cone recipe uses a crepe-like batter to produce a cone that is a cross between a sugar cone and a crepe. You can cook the batter on a griddle or in a nonstick saute pan over medium-low heat. Once the batter is cooked until golden brown on both sides it is removed from the heat and quickly rolled (while still hot) into the shape of a cone. Squeeze the end of the cone to seal it, so the ice cream won't drip out the bottom of the cone, and place the cone on a wire rack to cool. The cones are best eaten within a few hours of making them. However, if you have leftovers they can be reheated and re-rolled the next day with excellent results. Making these cones does take a little practice, both in cooking the batter and rolling them into a cone shape. But you will find it definitely worth the effort. Ice Cream Cones: In a medium sized bowl whisk together (or use a hand mixer) the eggs and sugar until frothy. Then whisk in the melted butter, milk, and vanilla extract. Add the flour and salt and whisk until the batter is smooth. The batter should be quite thin (like a crepe batter) so add more milk if the consistency is too thick. Heat a 8-9 inch (20-23 cm) saute or crepe pan over medium heat until hot. Reduce the heat to medium low and brush the pan lightly with a flavorless oil (vegetable, corn, canola, safflower or a light olive oil). Pour or ladle about 3-4 tablespoons of batter into the center of the pan and immediately tilt or rotate the pan so the batter forms a thin circle (about a 6 inch (15 cm) round). Place your pan back on the heat and cook until the batter is set and you can see the underside and edges are golden brown (about 3 - 4 minutes). Slip a metal spatula under the crepe and gently flip it over. Cook until golden brown. Remove the pan from the heat and slide the crepe from the pan onto your work surface. 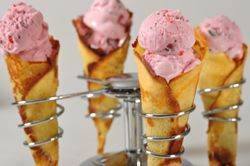 While the crepe is still hot, quickly start at one edge and roll the crepe into a cone shape. Squeeze the tip of the cone to seal it so the ice cream won't drip out. Place on a wire rack to cool completely. Continue making the rest of the cones, lightly brushing the pan with oil each time. These cones are best the day they are made. However, you can store leftover cones in a covered container. To re-crisp the cones preheat the oven to 400 degrees F (205 degrees C). Working with one cone at a time, unroll the cone until it is a circle again, place on a baking sheet and bake for about 3-5 minutes or until the crepe is hot and soft. Remove from oven and place the hot crepe on your work surface. Quickly reroll into a cone shape, again squeezing the tip of the cone so the ice cream won't drip out. Place on a wire rack to cool. Continue with the rest of the cones. Makes about 8 ice cream cones.